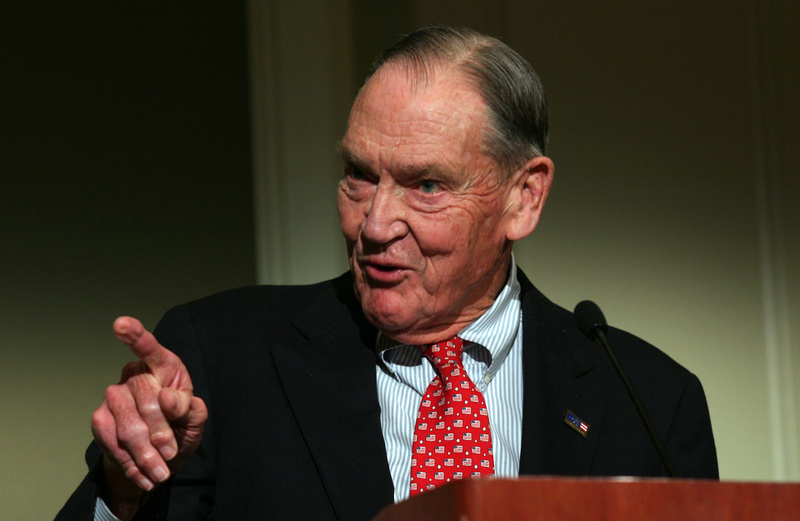 COMMENTARY: Vanguard founder John Bogle will be honored next week in New York at the John C. Bogle Legacy Forum. Organizers and speakers for the event include esteemed financial figures such as Paul Volcker, former chair of the Federal Reserve, and former SEC chair Arthur Levitt. Though I could go on and on about what Bogle has done for investors, I decided instead to quantify and estimate how much he will save investors in 2012 alone. Bogle brought the first index fund to the public in 1975. Far from being welcomed with open arms, this S&P 500 index fund was called "un-American" and dubbed "Bogle's folly." Fast forward 36 years and, according to Morningstar, investors have poured over $1.9 trillion into equity and bond index funds. This includes both mutual funds and exchange traded funds. I requested that Morningstar exclude such "index funds" as levered and inverse funds. The weighted average annual expense ratio of index funds last year was 0.23 percent for equity funds, and 0.18 percent for bond funds. This compares to the active funds showing 0.92% and 0.66%, respectively. Multiplying the lower fees by the assets results in an estimated $12.4 billion in funds investors are keeping. Because index funds don't churn their underlying portfolios like active funds do, I estimate another $11.5 billion is saved from having very little turnover. Thus, I attribute $23.9 billion in estimated savings this year, all from the index fund Bogle brought the main street investor early in his career. Is my estimate too conservative? I'll be the first to admit that these are rough estimates, yet I'd argue that they are actually way too conservative. These savings are from index funds alone. Bogle's focus on fees brought consumer pressure to bear on the industry, and I can only imagine what average fees would be today had Bogle not launched Vanguard Fund families. For example, Dreyfus, with average equity expense ratios of 1.44 percent for U.S. stocks, has fallen from the fourth largest fund family in 1980, to the 26th largest last year. Fund families with lower fees have fared much better. There could easily be another $24 billion to be had in cost savings from active funds as well. Don't forget, Vanguard has some very low cost active funds. Princeton professor, Burton Malkiel, author of A Random Walk Down Wall Street, will be one of the speakers at this forum. I credit him with teaching me the futility of spending money to try to outsmart the market. I credit Bogle with giving me the index fund as the tool to implement my investing. I asked Malkiel what Bogle has meant for investors, and he responded, "Jack Bogle is the greatest friend the individual investor has ever had." I couldn't agree more. Though I fear I'm dating myself here, other baby boomers like me may remember Lee Majors playing the "six million dollar man" on television. That's peanuts compared to Bogle who, without any bionic help, is at least the $24 billion man. And considering he could have chosen the option that might have put some of those billions into his own pocket rather than launching Vanguard as an investor-owned firm, the honors he will receive next week are well deserved. © 2012 CBS Interactive Inc.. All Rights Reserved. Allan S. Roth is the founder of Wealth Logic, an hourly based financial planning and investment advisory firm that advises clients with portfolios ranging from $10,000 to over $50 million. The author of How a Second Grader Beats Wall Street, Roth teaches investments and behavioral finance at the University of Denver and is a frequent speaker. He is required by law to note that his columns are not meant as specific investment advice, since any advice of that sort would need to take into account such things as each reader's willingness and need to take risk. His columns will specifically avoid the foolishness of predicting the next hot stock or what the stock market will do next month.